Brilliant Black Crystal Pearlcoat 2018 Ram 2500 SLT 4WD 6-Speed Automatic HEMI 5.7L V8 VVT Vehicle is equipped with: Luxury Group (Exterior Mirrors w/Supplemental Signals and Overhead Console w/Garage Door Opener), Quick Order Package 26G SLT, 3.73 Axle Ratio, 40/20/40 Split Bench Seat, 4-Wheel Disc Brakes, 5th Wheel/Gooseneck Towing Prep Group, 6 Speakers, ABS brakes, Air Conditioning, AM/FM radio, Black Exterior Mirrors, Brake assist, Bumpers: chrome, Charge Only Remote USB Port, Cloth 40/20/40 Bench Seat, Compass, Delay-off headlights, Driver door bin, Dual front impact airbags, Dual front side impact airbags, Electronic Stability Control, Electronically Controlled Throttle, Front anti-roll bar, Front Center Armrest w/Storage, Front reading lights, Fully automatic headlights, Heated door mirrors, Hemi Badge, Illuminated entry, Locking Tailgate, Low tire pressure warning, Manual Adjust Seats, Next Generation Engine Controller, Occupant sensing airbag, Outside temperature display, Overhead airbag, Overhead console, Panic alarm, Passenger door bin, Passenger vanity mirror, Power door mirrors, Power Folding Black Trailer Tow Mirrors, Power steering, Power windows, Radio data system, Radio: Uconnect 3 w/5" Display, Rear Power Sliding Window, Rear seat center armrest, Rear step bumper, Remote keyless entry, Speed control, Tachometer, Tilt steering wheel, Tip Start, Traction control, Trip computer, Variably intermittent wipers, Vendor Painted Cargo Box Tracking, Voltmeter, and Wheels: 18" x 8.0" Steel Chrome Clad. At Peake Chrysler Dodge Jeep Ram FIAT we believe that success is a satisfied customer, and profit is a by-product of hard work. Brilliant Black Crystal Pearlcoat 2018 Ram 2500 Tradesman 4WD 6-Speed Automatic Cummins 6.7L I6 Turbodiesel Vehicle is equipped with: Chrome Appearance Group (Bright Front Bumper, Bright Rear Bumper, and Wheels: 18" x 8.0" Steel Chrome Clad), Cold Weather Group (Engine Block Heater), Popular Equipment Group (40/20/40 Split Bench Seat, Front Armrest w/Cupholders, Manual Adjust Seats, and SiriusXM Satellite Radio), Power & Remote Entry Group (Black Exterior Mirrors, Exterior Mirrors w/Heating Element, and Power Windows w/Front 1-Touch Down), Quick Order Package 2FA Tradesman, Snow Chief Group (Anti-Spin Differential Rear Axle, Clearance Lamps, and I/P Mounted Auxiliary Switches), 220 Amp Alternator, 3.42 Axle Ratio, 3.73 Axle Ratio, 4-Wheel Disc Brakes, 5.0" Touchscreen Display, 6 Speakers, ABS brakes, Air Conditioning, AM/FM radio, Auto-dimming Rear-View mirror, Brake assist, Center Hub, Charge Only Remote USB Port, Delay-off headlights, Driver door bin, Dual Alternators Rated At 440 Amps, Dual front impact airbags, Dual front side impact airbags, Electric Shift-On-The-Fly Transfer Case, Electronic Stability Control, Electronically Controlled Throttle, Exterior Mirrors Courtesy Lamps, Front anti-roll bar, Front Bumper Sight Shields, Front Center Armrest, Front Rubber Floor Mats, Fully automatic headlights, Heavy Duty Vinyl 40/20/40 Split Bench Seat, Integrated Voice Command w/Bluetooth, LED Bed Lighting, Low tire pressure warning, Manufacturer's Statement of Origin, Media Hub (2 USB, AUX), Next Generation Engine Controller, Occupant sensing airbag, Overhead airbag, Passenger door bin, Power Black Trailer Tow Mirrors, Power steering, Radio data system, Radio: 3.0, Radio: Uconnect 3 w/5" Display, Rear step bumper, Speed control, Tachometer, Temperature & Compass Gauge, Tilt steering wheel, Tip Start, Traction control, Trailer Brake Control, Variably intermittent wipers, and Voltmeter. At Peake Chrysler Dodge Jeep Ram FIAT we believe that success is a satisfied customer, and profit is a by-product of hard work. Brilliant Black Crystal Pearlcoat 2018 Ram 2500 Tradesman 4WD 6-Speed Automatic 6.4L Heavy Duty V8 HEMI w/MDS Vehicle is equipped with: Chrome Appearance Group (Wheels: 18" x 8.0" Steel Chrome Clad), Popular Equipment Group (Carpet Floor Covering, Front & Rear Floor Mats, Remote Keyless Entry, and SiriusXM Satellite Radio), Quick Order Package 22A Tradesman (Front Armrest w/Cupholders), Snow Chief Group (Anti-Spin Differential Rear Axle, Clearance Lamps, and I/P Mounted Auxiliary Switches), 220 Amp Alternator, 3.73 Axle Ratio, 4.10 Axle Ratio, 40/20/40 Split Bench Seat, 4-Wheel Disc Brakes, 5.0" Touchscreen Display, 5th Wheel/Gooseneck Towing Prep Group, 6 Speakers, ABS brakes, Air Conditioning, AM/FM radio, Auto-dimming Rear-View mirror, Black Exterior Mirrors, Brake assist, Center Hub, Delay-off headlights, Driver door bin, Dual front impact airbags, Dual front side impact airbags, Electric Shift-On-The-Fly Transfer Case, Electronic Stability Control, Electronically Controlled Throttle, Exterior Mirrors w/Heating Element, Front anti-roll bar, Front Center Armrest, Fully automatic headlights, Heated door mirrors, Heavy Duty Vinyl 40/20/40 Split Bench Seat, Hemi Badge, Locking Tailgate, Low tire pressure warning, Manual Adjust Seats, Media Hub (USB, AUX), Next Generation Engine Controller, Occupant sensing airbag, Overhead airbag, Passenger door bin, Power door mirrors, Power steering, Power windows, Radio data system, Radio: 3.0, Radio: Uconnect 3 w/5" Display, Rear Folding Seat, Rear step bumper, Speed control, Storage Tray, Tachometer, Tilt steering wheel, Tip Start, Traction control, Trailer Brake Control, Variably intermittent wipers, Vendor Painted Cargo Box Tracking, and Voltmeter. At Peake Chrysler Dodge Jeep Ram FIAT we believe that success is a satisfied customer, and profit is a by-product of hard work. Brilliant Black Crystal Pearlcoat 2018 Ram 2500 Laramie 4WD 6-Speed Automatic 6.4L Heavy Duty V8 HEMI w/MDS Vehicle is equipped with: Convenience Group (Auto High Beam Headlamp Control and Rain Sensitive Windshield Wipers), Quick Order Package 22H Laramie, Snow Chief Group (Anti-Spin Differential Rear Axle, Clearance Lamps, and I/P Mounted Auxiliary Switches), Snow Chief Group w/32C Discount, 10 Speakers, 115V Auxiliary Power Outlet, 220 Amp Alternator, 3.73 Axle Ratio, 40/20/40 Split Bench Seat, 4-Wheel Disc Brakes, 5-Year SiriusXM Traffic Service, ABS brakes, Air Conditioning, AM/FM radio, Audio memory, Auto-dimming door mirrors, Auto-dimming Rear-View mirror, Automatic temperature control, Black Exterior Mirrors, Brake assist, Bumpers: chrome, Chrome Tubular Side Steps, Compass, Delay-off headlights, Driver door bin, Driver vanity mirror, Dual front impact airbags, Dual front side impact airbags, Electronic Stability Control, Emergency communication system, Exterior Mirrors Courtesy Lamps, Exterior Mirrors w/Heating Element, Exterior Mirrors w/Supplemental Signals, Front anti-roll bar, Front Center Armrest w/Storage, Front dual zone A/C, Front fog lights, Front reading lights, Fully automatic headlights, Garage door transmitter, Heated door mirrors, Heated Front Seats, Heated front seats, Heated steering wheel, Illuminated entry, Keyless Enter-N-Go, Keyless Go w/32C Discount, Leather steering wheel, Leather Trim 40/20/40 Bench Seat, Low tire pressure warning, Memory seat, Occupant sensing airbag, Outside temperature display, Overhead airbag, Overhead console, Panic alarm, Passenger door bin, Passenger vanity mirror, Power door mirrors, Power driver seat, Power Folding Chrome Trailer Tow Mirrors, Power Folding Mirrors, Power passenger seat, Power steering, Power Sunroof, Power windows, Radio data system, Radio: Uconnect 4C Nav w/8.4" Display, Radio: Uconnect 4C w/8.4" Display, Rear seat center armrest, Rear step bumper, Remote keyless entry, Remote Proximity Keyless Entry, Remote Start System, Remote Start System w/32C Discount, Security system, SiriusXM Satellite Radio, Speed control, Split folding rear seat, Steering wheel mounted audio controls, Tachometer, Tilt steering wheel, Traction control, Trailer Tow Mirrors, Trip computer, Turn signal indicator mirrors, Variably intermittent wipers, Vendor Painted Cargo Box Tracking, Ventilated front seats, Voltmeter, and Wheels: 18" x 8.0" Polished Aluminum. At Peake Chrysler Dodge Jeep Ram FIAT we believe that success is a satisfied customer, and profit is a by-product of hard work. Crystal Metallic 2018 Ram 2500 Laramie 4WD 6-Speed Automatic 6.4L Heavy Duty V8 HEMI w/MDS Vehicle is equipped with: Convenience Group (Auto High Beam Headlamp Control and Rain Sensitive Windshield Wipers), Quick Order Package 22H Laramie, Snow Chief Group (Anti-Spin Differential Rear Axle, Clearance Lamps, and I/P Mounted Auxiliary Switches), Snow Chief Group w/32C Discount, 10 Speakers, 115V Auxiliary Power Outlet, 220 Amp Alternator, 3.73 Axle Ratio, 40/20/40 Split Bench Seat, 4-Wheel Disc Brakes, 5-Year SiriusXM Traffic Service, ABS brakes, Air Conditioning, AM/FM radio, Audio memory, Auto-dimming door mirrors, Auto-dimming Rear-View mirror, Automatic temperature control, Black Exterior Mirrors, Brake assist, Bumpers: chrome, Chrome Tubular Side Steps, Compass, Delay-off headlights, Driver door bin, Driver vanity mirror, Dual front impact airbags, Dual front side impact airbags, Electronic Stability Control, Emergency communication system, Exterior Mirrors Courtesy Lamps, Exterior Mirrors w/Heating Element, Exterior Mirrors w/Supplemental Signals, Front anti-roll bar, Front Center Armrest w/Storage, Front dual zone A/C, Front fog lights, Front reading lights, Fully automatic headlights, Garage door transmitter, Heated door mirrors, Heated Front Seats, Heated front seats, Heated steering wheel, Illuminated entry, Keyless Enter-N-Go, Keyless Go w/32C Discount, Leather steering wheel, Leather Trim 40/20/40 Bench Seat, Low tire pressure warning, Memory seat, Occupant sensing airbag, Outside temperature display, Overhead airbag, Overhead console, Panic alarm, Passenger door bin, Passenger vanity mirror, Power door mirrors, Power driver seat, Power Folding Chrome Trailer Tow Mirrors, Power Folding Mirrors, Power passenger seat, Power steering, Power Sunroof, Power windows, Radio data system, Radio: Uconnect 4C Nav w/8.4" Display, Radio: Uconnect 4C w/8.4" Display, Rear seat center armrest, Rear step bumper, Remote keyless entry, Remote Proximity Keyless Entry, Remote Start System, Remote Start System w/32C Discount, Security system, SiriusXM Satellite Radio, Speed control, Split folding rear seat, Steering wheel mounted audio controls, Tachometer, Tilt steering wheel, Traction control, Trailer Tow Mirrors, Trip computer, Turn signal indicator mirrors, Variably intermittent wipers, Vendor Painted Cargo Box Tracking, Ventilated front seats, Voltmeter, and Wheels: 18" x 8.0" Polished Aluminum. At Peake Chrysler Dodge Jeep Ram FIAT we believe that success is a satisfied customer, and profit is a by-product of hard work. Diamond Black 2019 Ram 2500 Tradesman 4WD 6-Speed Automatic Cummins 6.7L I6 Turbodiesel Vehicle is equipped with: Chrome Appearance Group (Bright Front Bumper and Wheels: 18" x 8.0" Steel Chrome Clad), Off Road Package (Tow Hooks), Quick Order Package 2HA Tradesman, Snow Chief Group (220 Amp Alternator, Anti-Spin Differential Rear Axle, Clearance Lamps, and I/P Mounted Auxiliary Switches), Tradesman Level 1 Equipment Group, 17" x 7.5" Steel Styled Wheels, 2 Way Rear Headrest Seat, 3.73 Axle Ratio, 4 Way Front Headrests, 40/20/40 Split Bench Seat, 4-Wheel Disc Brakes, 6 Speakers, ABS brakes, Active Noise Control System, Air Conditioning, AM/FM radio, Black Exterior Mirrors, Brake assist, Compass, Delay-off headlights, Driver door bin, Dual front impact airbags, Dual front side impact airbags, Electric Shift-On-The-Fly Transfer Case, Electronic Stability Control, Electronically Controlled Throttle, Exterior Mirrors Courtesy Lamps, Exterior Mirrors w/Heating Element, Exterior Mirrors w/Supplemental Signals, Front anti-roll bar, Front Center Armrest w/Storage, Front reading lights, Fully automatic headlights, Heated door mirrors, Heavy Duty Vinyl 40/20/40 Split Bench Seat, Illuminated entry, LED Bed Lighting, Low tire pressure warning, Manual Adjust 4-Way Driver Seat, Occupant sensing airbag, Outside temperature display, Overhead airbag, Overhead console, ParkSense Rear Park Assist System, Passenger door bin, Passenger vanity mirror, Power Adjust & Heated Black Tow Mirrors, Power door mirrors, Power steering, Power windows, Radio data system, Radio: Uconnect 3 w/5" Display, Rear anti-roll bar, Rear Folding Seat, Rear step bumper, Rear Wheelhouse Liners, Speed control, Tachometer, Tilt steering wheel, Tip Start, Traction control, Trailer Brake Control, Trailer Tow Mirrors, Variably intermittent wipers, and Voltmeter. At Peake Chrysler Dodge Jeep Ram FIAT we believe that success is a satisfied customer, and profit is a by-product of hard work. Crystal Metallic 2018 Ram 2500 Laramie 4WD 6-Speed Automatic 6.4L Heavy Duty V8 HEMI w/MDS Vehicle is equipped with: Convenience Group (Auto High Beam Headlamp Control), Heavy Duty Snow Plow Prep Group (220 Amp Alternator), Off Road Package (Front Performance Tuned Shock Absorbers, Offroad Decal, and Rear Performance Tuned Shock Absorbers), Off Road Package w/32C Discount, Quick Order Package 22H Laramie, 10 Speakers, 115V Auxiliary Power Outlet, 3.73 Axle Ratio, 40/20/40 Split Bench Seat, 4-Wheel Disc Brakes, 8.4" Touchscreen Display, ABS brakes, Air Conditioning, AM/FM radio, Anti-Spin Differential Rear Axle, Audio memory, Auto-dimming door mirrors, Auto-dimming Rear-View mirror, Automatic temperature control, Brake assist, Bumpers: chrome, Center Hub, Chrome Exterior Mirrors, Chrome Tubular Side Steps, Clearance Lamps, Compass, Delay-off headlights, Driver door bin, Driver vanity mirror, Dual Alternators Rated At 380 Amps, Dual front impact airbags, Dual front side impact airbags, Electronic Stability Control, Electronically Controlled Throttle, Emergency communication system, Exterior Mirrors Courtesy Lamps, Exterior Mirrors w/Heating Element, Exterior Mirrors w/Memory, Exterior Mirrors w/Supplemental Signals, Front anti-roll bar, Front Center Armrest w/Storage, Front Center Seat Cushion Storage, Front dual zone A/C, Front fog lights, Front reading lights, Fully automatic headlights, Garage door transmitter, GPS Antenna Input, Heated door mirrors, Heated Front Seats, Heated front seats, Heated steering wheel, Hemi Badge, High Back Seats, Illuminated entry, Integrated Voice Command w/Bluetooth, Keyless Enter-N-Go, Keyless Go w/32C Discount, Leather steering wheel, Leather Trim 40/20/40 Bench Seat, Locking Tailgate, Low tire pressure warning, Manufacturer's Statement of Origin, Media Hub (2 USB, AUX), Memory seat, Occupant sensing airbag, Outside temperature display, Overhead airbag, Overhead console, Panic alarm, Passenger door bin, Passenger vanity mirror, Power 10-Way Memory Driver & 6-Way Passenger Seats, Power door mirrors, Power driver seat, Power Folding Chrome Trailer Tow Mirrors, Power Lumbar Adjust, Power passenger seat, Power steering, Power Sunroof, Power windows, Power-Folding Mirrors, Radio data system, Radio: Uconnect 4C Nav w/8.4" Display, Radio: Uconnect 4C w/8.4" Display, Rear 60/40 Split Folding Seat, Rear seat center armrest, Rear step bumper, Rear Window Defroster, Rear Window Defroster w/32C Discount, Remote keyless entry, Remote Start System, Security system, SiriusXM Satellite Radio, SiriusXM Traffic Plus, SiriusXM Travel Link, Speed control, Split folding rear seat, Spray In Bedliner, Steering wheel mounted audio controls, Tachometer, Tilt steering wheel, Tip Start, Traction control, Trip computer, Turn signal indicator mirrors, Variably intermittent wipers, Vendor Painted Cargo Box Tracking, Ventilated Front Seats, Ventilated front seats, Voltmeter, and Wheels: 18" x 8.0" Polished Aluminum. At Peake Chrysler Dodge Jeep Ram FIAT we believe that success is a satisfied customer, and profit is a by-product of hard work. Brilliant Black Crystal Pearlcoat 2018 Ram 2500 Big Horn 4WD 6-Speed Automatic Cummins 6.7L I6 Turbodiesel Vehicle is equipped with: Big Horn Silver Edition (Bright Grille, Charge Only Remote USB Port, Chrome Exterior Mirrors, Exterior Mirrors w/Supplemental Signals, Wheel to Wheel Side Steps, and Wheels: 20" x 8.0" Polished w/Mineral Gray Inserts), Cold Weather Group (Engine Block Heater), Heavy Duty Snow Plow Prep Group, Protection Group, Quick Order Package 2FZ Big Horn (40/20/40 Split Bench Seat), 220 Amp Alternator, 3.42 Axle Ratio, 3.73 Axle Ratio, 4-Wheel Disc Brakes, 6 Speakers, ABS brakes, Air Conditioning, AM/FM radio, Black Exterior Mirrors, Brake assist, Bumpers: chrome, Clearance Lamps, Cloth 40/20/40 Bench Seat, Compass, Delay-off headlights, Driver door bin, Dual Alternators Rated At 440 Amps, Dual front impact airbags, Dual front side impact airbags, Electronic Stability Control, Electronically Controlled Throttle, Front anti-roll bar, Front Center Armrest w/Storage, Front reading lights, Fully automatic headlights, Heated door mirrors, Hemi Badge, I/P Mounted Auxiliary Switches, Illuminated entry, Locking Tailgate, Low tire pressure warning, Manual Adjust Seats, Next Generation Engine Controller, Occupant sensing airbag, Outside temperature display, Overhead airbag, Overhead console, Panic alarm, ParkSense Front/Rear Park Assist System, Passenger door bin, Passenger vanity mirror, Power door mirrors, Power Folding Chrome Trailer Tow Mirrors, Power steering, Power windows, Radio data system, Radio: Uconnect 3 w/5" Display, Radio: Uconnect 4C w/8.4" Display, Rear seat center armrest, Rear step bumper, Rear Window Defroster, Remote keyless entry, Speed control, Spray In Bedliner, Tachometer, Tilt steering wheel, Tip Start, Traction control, Trip computer, Variably intermittent wipers, Vendor Painted Cargo Box Tracking, Voltmeter, and Wheels: 18" x 8.0" Steel Chrome Clad. At Peake Chrysler Dodge Jeep Ram FIAT we believe that success is a satisfied customer, and profit is a by-product of hard work. Mojave 2018 Ram 2500 Power Wagon 4WD 6-Speed Automatic 6.4L Heavy Duty V8 HEMI w/MDS Vehicle is equipped with: Convenience Group (Auto High Beam Headlamp Control and Rain Sensitive Windshield Wipers), Leather & Luxury Group (#1 Seat Foam Cushion, 115V Auxiliary Power Outlet, 40/20/40 Split Bench Seat, 9 Alpine Speakers w/Subwoofer, Auto-Dimming Exterior Mirrors, Auto-Dimming Rear-View Mirror, Black Painted Exterior Mirrors, Black Power Fold-Away Mirrors, Charge Only Remote USB Port, Deluxe Door Trim Panel, Exterior Mirrors Courtesy Lamps, Exterior Mirrors w/Memory, Exterior Mirrors w/Supplemental Signals, Folding Flat Load Floor Storage, Front Armrest w/Cupholders, Front Center Seat Cushion Storage, Front Door Accent Lighting, Glove Box Lamp, Heated Front Seats, Heated Steering Wheel, High Back Seats, Leather Trim 40/20/40 Bench Seat, LED Interior Lighting, Overhead Console w/Garage Door Opener, ParkSense Front/Rear Park Assist System, Power 10-Way Memory Driver & 6-Way Passenger Seats, Power Folding Mirrors, Power Lumbar Adjust, Radio/Driver Seat/Mirror Memory, Rear 60/40 Split Folding Seat, Rear Dome w/On/Off Switch Lamp, Rear Door Accent Lighting, Security Alarm, Sun Visors w/Illuminated Vanity Mirrors, Universal Garage Door Opener, and Ventilated Front Seats), Mojave Sand Power Wagon Package (Body Color Door Handles and Wheels: 17" x 8.0" Black Painted Aluminum), Quick Order Package 22P Power Wagon (Flat Black 6.4L Hemi Badge and Flat Black Ram 2500 Badge), 1-Year SiriusXM Guardian Trial, 4.10 Axle Ratio, 4-Wheel Disc Brakes, 5-Year SiriusXM Traffic Service, 5-Year SiriusXM Travel Link Service, 6 Speakers, 8.4" Touchscreen Display, ABS brakes, Air Conditioning, Air Conditioning ATC w/Dual Zone Control, Alloy wheels, AM/FM radio, Apple CarPlay, Auto-dimming Rear-View mirror, Black Exterior Mirrors, Black MIC Exterior Mirrors, Black Tubular Side Steps, Block heater, Brake assist, Cloth Bench Seat w/Emboss Tread Pattern, Compass, CTR Stop Lamp w/Cargo View Camera, Delay-off headlights, Driver door bin, Dual front impact airbags, Dual front side impact airbags, Electronic Stability Control, Exterior Mirrors w/Heating Element, For Details Visit DriveUconnect.com, Front anti-roll bar, Front Center Armrest w/Storage, Front fog lights, Front reading lights, Fully automatic headlights, Google Android Auto, GPS Antenna Input, GPS Navigation, HD Radio, Heated door mirrors, Illuminated entry, Integrated Center Stack Radio, Integrated Voice Command w/Bluetooth, KEYLESS GO®, Leather steering wheel, LED Bed Lighting, Locking Tailgate, Low tire pressure warning, Media Hub (2 USB, AUX), Occupant sensing airbag, Outside temperature display, Overhead airbag, Overhead console, Panic alarm, Passenger door bin, Passenger vanity mirror, Power door mirrors, Power Fold Black Trailer Tow Mirror w/Memory, Power steering, Power Sunroof, Power windows, Radio data system, Radio: Uconnect 3 w/5" Display, Radio: Uconnect 4C Nav w/8.4" Display, Rear seat center armrest, Rear step bumper, Rear Window Defroster, Remote keyless entry, Remote Proximity Keyless Entry, Remote Start System, SiriusXM Satellite Radio, SiriusXM Traffic Plus, SiriusXM Travel Link, Speed control, Split folding rear seat, Spray In Bedliner, Steering wheel mounted audio controls, Tachometer, Tilt steering wheel, Traction control, Trailer Tow Mirrors, Tri-Fold Tonneau Cover, Trip computer, Variably intermittent wipers, Vendor Painted Cargo Box Tracking, and VoltmeteR. At Peake Chrysler Dodge Jeep Ram FIAT we believe that success is a satisfied customer, and profit is a by-product of hard work. Diamond Black 2019 Ram 2500 Laramie 4WD 8-Speed Automatic 6.4L Heavy Duty V8 HEMI w/MDS Vehicle is equipped with: Laramie Level 2 Equipment Group (17 Speaker High Performance Audio, 1-Year SiriusXM Guardian Trial, 5-Year SiriusXM Traffic Service, 5-Year SiriusXM Travel Link Service, Auto High Beam Headlamp Control, Blind Spot & Cross Path Detection, Disassociated Touchscreen Display, Foam Bottle Insert (Door Trim Panel), For Details Visit DriveUconnect.com, GPS Navigation, HD Radio, Power Adjustable Pedals w/Memory, Power Chrome Tow Mirrors w/Convex Spotter & Memory, Rain Sensitive Windshield Wipers, Ramcharger Wireless Charging Pad, Single Disc Remote CD Player, SiriusXM Traffic Plus, and SiriusXM Travel Link), Off Road Package (Rear Performance Tuned Shock Absorbers), Quick Order Package 2ZH Laramie, Safety Group (Adaptive Cruise Control w/Stop and Full Speed Forward Collision Warning Plus), Snow Chief Group (220 Amp Alternator, Anti-Spin Differential Rear Axle, Clearance Lamps, and I/P Mounted Auxiliary Switches), Towing Technology Group (CTR Stop Lamp w/Cargo View Camera and Surround View Camera System), 10 Speakers, 115V Auxiliary Rear Power Outlet, 12" Touchscreen Display, 2 Way Rear Headrest Seat, 3.73 Axle Ratio, 4 Way Front Headrests, 4-Wheel Disc Brakes, ABS brakes, Active Noise Control System, Adjustable pedals, Air Conditioning, AM/FM radio: SiriusXM, Apple CarPlay, Auto-dimming Rear-View mirror, Automatic temperature control, Brake assist, Bumpers: chrome, Compass, Delay-off headlights, Driver door bin, Driver vanity mirror, Dual front impact airbags, Dual front side impact airbags, Electronic Stability Control, Electronically Controlled Throttle, Front anti-roll bar, Front Center Armrest w/Storage, Front dual zone A/C, Front fog lights, Front reading lights, Front Seat Back Map Pockets, Fully automatic headlights, Garage door transmitter, Google Android Auto, GPS Antenna Input, Heated door mirrors, Heated Front Seats, Heated front seats, Heated Steering Wheel, Heated steering wheel, Illuminated entry, Integrated Voice Command w/Bluetooth, Leather steering wheel, Leather Trim 40/20/40 Bench Seat, Low tire pressure warning, Occupant sensing airbag, Outside temperature display, Overhead airbag, Overhead console, Panic alarm, ParkSense Front/Rear Park Assist System, Passenger door bin, Passenger vanity mirror, Power 2-Way Driver Lumbar Adjust, Power 2-Way Passenger Lumbar Adjust, Power Adjust 8-Way Driver Seat, Power Adjust 8-Way Front Passenger Seat, Power Deployable Running Boards, Power door mirrors, Power driver seat, Power passenger seat, Power steering, Power windows, Radio data system, Radio: Uconnect 12.0 w/Navigation, Radio: Uconnect 4 w/8.4" Display, Rear 60/40 Folding Seat, Rear anti-roll bar, Rear seat center armrest, Rear step bumper, Rear window defroster, Remote keyless entry, Security system, Speed control, Split folding rear seat, Steering wheel mounted audio controls, Tachometer, Tilt steering wheel, Tip Start, Traction control, Tri-Fold Tonneau Cover, Trip computer, Turn signal indicator mirrors, USB Host Flip, Variably intermittent wipers, Vendor Painted Cargo Box Tracking, Voltmeter, and Wheels: 18" x 8.0" Polished AluminuM. 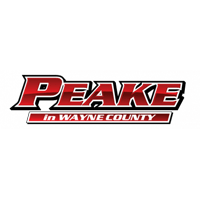 At Peake Chrysler Dodge Jeep Ram FIAT we believe that success is a satisfied customer, and profit is a by-product of hard work.